Had a great time playing this! Got the True End first time, so I'm pretty happy about that, gonna try for the bad route, but I had a ton of fun getting to know the characters! Hope to see more from you in the future! Great game! it was like reading a fanfiction lmao. My constructive criticism would be to draw the more of the characters in the story. 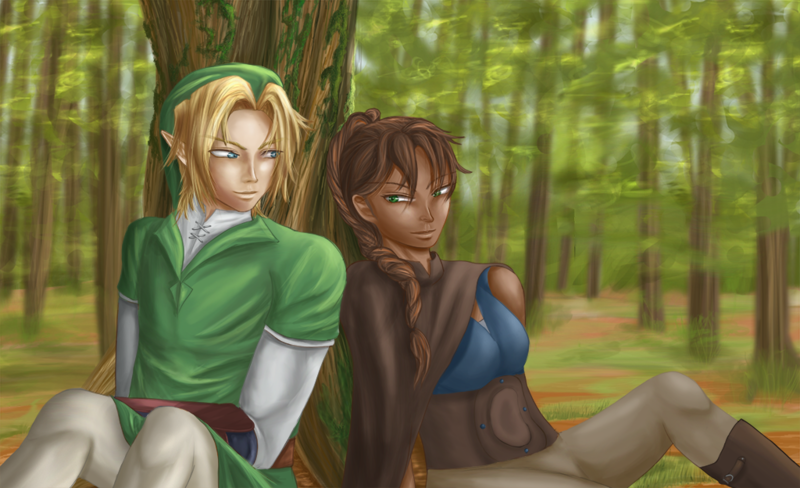 I was a little disappointed that you didn't draw Malon/Talon/Oldman/Dark Link. Second I felt that some of the characters were drawn awkwardly (Except Link. I liked how he was drawn.) Mostly Zelda and Erina were the ones who could use a bit more retouching. Lastly, I'm greedy for CGs. I want more than 3 sorry not sorry. Okay that out the way, Let's focus on the good aspects of the story. I loved the way it's written and how you gave Link more of a personality (honestly I'm glad he isn't a quiet mute who has this perfect hero persona most people try to give him.) He is funny, witty, and has flaws which is great. I also like how our lovely protagonist isn't Ms. Perfect. I love how she is clever, but a horrible fighter. That makes her more charming and likeable. I can't stand perfect protagonists because I can't put myself in their shoes. Kietha also has a small feature to her that is able for me to relate to, but she also gets to be her own person. I applaud you for making a good protagonist.